Foundation grants have made it possible to establish a ground-breaking research project about a stimulating patient environment at the neuro intensive care unit in Aarhus. It is a unique solution that integrates Chroma Zenit Circadian Lighting and functional lighting, noise masking, music intervention, individual info monitors and camera observation. The staff is thrilled with the new initiative. ”We have to develop and document the new knowledge about the stimulating patient environment – and ensure that this knowledge becomes implemented and used to optimise the patient environments of the future”, say Leanne Langhorn and Lone Moeslund – both working at the neuro intensive care unit as a clinical nursing specialist/ RN, MScn, PhD and intensive care nurse/ coordinator of patient care respectively. As a start-up for the project, it was defined that optimally, a stimulating patient environment should reduce commotion and noise, optimise the patient’s personal space, provide individual stimuli, create calm and a sense of security for the patient and next of kin, ensure functional light and Chroma Zenit Circadian Lighting and optimise communication. As part of the project, Chromaviso is to develop Chroma Zenit Circadian Lighting further, while scientists form clinical documentation for Chroma Zenit Circadian Lighting and the integrated patient environment with light, sound, visual information and monitoring. The lighting component fulfils the wish for focused light, functional night light and available daylight. Chroma Zenit Circadian Lighting contributes to a natural circadian rhythm for patients as well as staff. The functional night light makes it possible for the staff to disturb the patient as little as possible when doing their work at night. Chroma Zenit Circadian Lighting follows the natural rhythm of the sun. It rises in the morning, is the most intensive in the middle of the day, and at night, a specially designed night light with built-in monitoring is turned on. the patient’s sleep pattern positively. At patient getting a good night’s sleep is better rested and thus less confused and consequently ready for early rehabilitation. In intensive care rooms, patients are exposed to undesirable sound influence from interior fittings and machines, the other patients and from the staff. The purpose of the sound component of the project is to control the noise impact occurring in connection with emergency situations. This happens through directional sound. Furthermore, music intervention can be used to stimulate the patient. In an emergency situation, it is possible to mask the noise, resulting in less impact on the other patients and their next of kin from what is taking place in the room. An information board is installed on a flexible arm at each bed. The monitor shows who the patient is, where the patient is and what time it is. This makes quick and systematic information possible. Furthermore, you can see the schedule for the day and a general plan for the patient. It is possible to use the visual component to stimulate the patient, for example with mood pictures and seasonal pictures. The monitoring provides the most sense of security for patient and next of kin at night. In this way, the staff can observe the patient without disturbing his or her sleep, which is a significant advantage. In emergency situations, when emergency lighting is turned on, the monitoring and the masking noise are automatically activated. The project is subsidised by The Market Development Fund and has a total budget of DKK 9,6 million. It is a collaboration between Chromaviso, Glostrup Hospital and Aarhus University Hospital. The research related part of the project takes place at the neurosurgical unit at Aarhus University Hospital and the neurological unit at Glostrup Hospital. 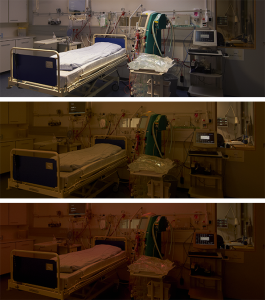 Both places research the effect of Circadian Lighting on patients as well as staff.